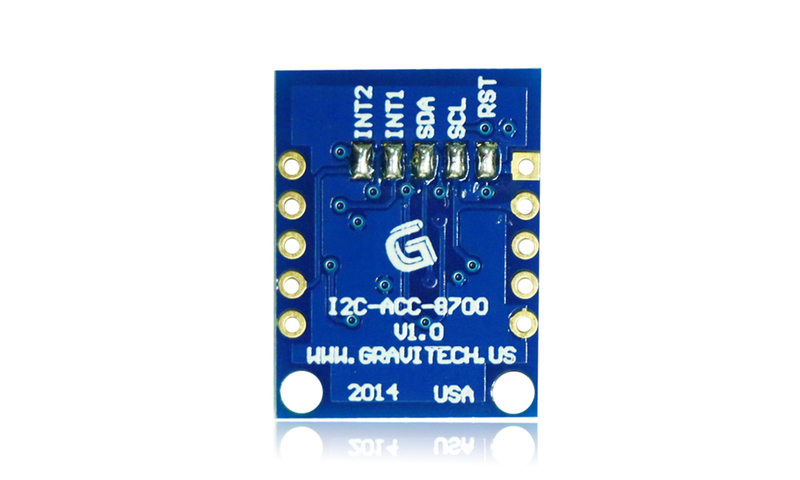 I2C-ACC-8700 is a LOW COST low power full feature ready to use small 10 pin CMOS device that provides accurate, reliable 3-axis linear accelerometer and 3-axis magnetometer. The low voltage use, coupled with the low energy dissipation makes this an ideal solution for mobile sensing application where battery life is a concern. This compact small device comes with pin headers so you connect it to your breadboard. 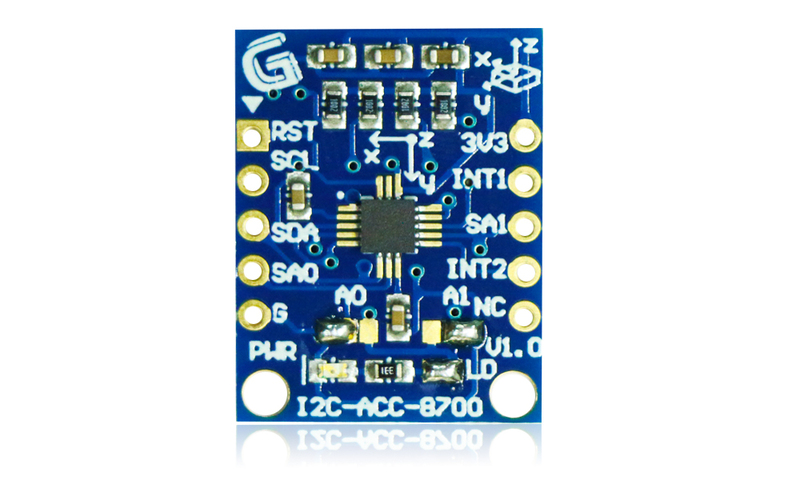 It is 14-bit accelerometer and 16-bit magnetometer ADC resolution along with smart-embedded functions. It has dynamically selectable acceleration full scale ranges of �g/�g/�g and a fixed magnetic measurement range of �00 μT. Output data rates (ODR) from 1.563 Hz to 800 Hz are selectable by the user for each sensor. Interleaved magnetic and acceleration data is available at ODR rates of up to 400 Hz. The is ready to use device. It contains many innovative features like on-board selectable I2C addresses jumpers, I2C bus and open drain pull-up resistors, power LEDs. You can use this cool device on many projects that require sensing linear acceleration and direction such as navigation, E-compass, robotics, orientation detection, gaming, real-time activity analysis, fall detection, vibration monitoring, etc. NOTE: The maximum voltage for this device is 3.3V so you'll need a voltage level translator if use with 5V microcontroller. � Programmable automatic ODR change using Auto-Wake and return to Sleep functions to save power. This function works with both magnetic and acceleration event interrupt sources. 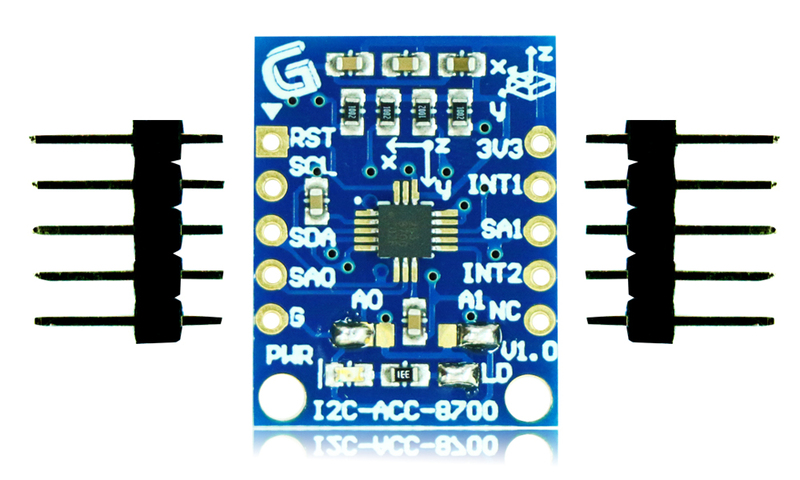 I2C-ACC-8700 is a low cost low power ready to use small 10 pin CMOS device that provides accurate, reliable 3-axis linear accelerometer and 3-axis magnetometer. 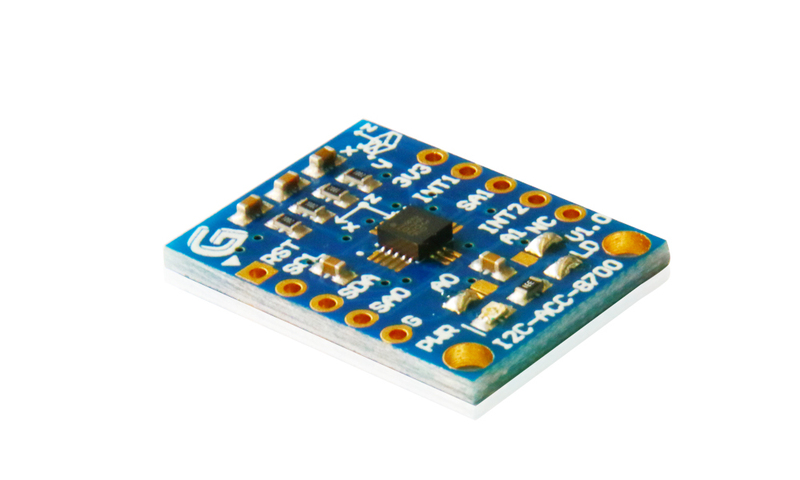 The accelerometer is 14-bit with selectable range +/-2g, +/-4g or +/-8g. The magnetometer is 16-bit at +/-1200uT.